Rose-Hulman Institute of Technology has announced an acquisition that will make the school's footprint six times larger. The more than 1,100-acre property is the former home of Mari Hulman George and sits just south of the Terre Haute campus. President Jim Conwell calls the deal a game-changer that will boost Rose-Hulman's profile as a leader in science, technology, engineering and math "for decades to come." In an interview with Inside INdiana Business, Conwell credits the school's century-long relationship with the Hulman family. In 1917, Tony and Mary Fendrich Hulman donated 123 acres to Rose Polytechnic, as it was called at the time, expanding the school to its present-day footprint. "I think they feel very comfortable with Rose-Hulman being good stewards of the property and on top of that, utilize the property to its full potential," Conwell said. As far as he knows, discussions involving Rose-Hulman acquiring the land go back 30 years or more, but a final agreement has involved "an intensive, yearlong" process. Rose-Hulman Board Member Tony George, son of Mari Hulman George and chairman of Hulman and Co., which owns Terre Haute-based Clabber Girl Corp., the Indianapolis Motor Speedway and the IndyCar Series, says "I am pleased that this property will remain in good hands. This expansion of Rose-Hulman's footprint ushers in a new era of possibilities for the institute, building on a tradition of excellence as it focuses on enriching experienced-based, cross-cutting learning to prepare future generations of problem-solvers." The full vision of how the land will be used, Conwell said, has yet to be determined, but he says the process for a new long-term strategic plan will kick off next year. 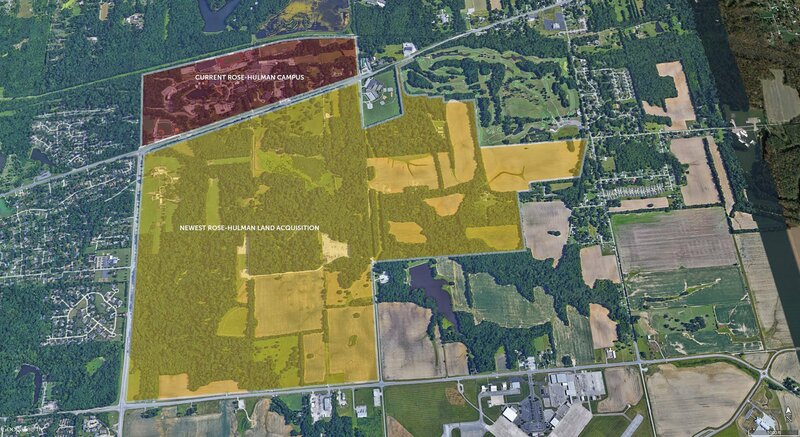 "So the question is," Conwell asked, "do I know what we can do with that land? No, but I think it certainly illustrates -- just the sheer size of it -- that the entire realm of possibilities is out there and we're going to explore that as we developer our new strategic plan moving forward." The property includes a large house, historic family lodge, outbuildings, farmland and forest. Rose-Hulman was founded in 1874 has around 2,300 undergraduate and graduate students.